6 years ago, I embarked on a journey of making a change in my own wellbeing – contentment, health, and happiness. Since then, yoga has been one of my wellbeing tools that helped me accept my limitations, recognize my strengths, and let go of my frustrations. Yoga gives me a more positive outlook while facing the unpredictability of life. Being an ambassador of Africa Yoga Project (AYP) gives me the opportunity to share yoga as a wellbeing tool with others, while giving back to the communities. Africa Yoga Project (AYP), based in Nairobi, has done an amazing job across Africa and its mission is to empower youth to step into their greatness as global wellbeing leaders and build the wellbeing value chain in Africa. Every week ~360 people from all walks of life in Nairobi gather at our community center to practice yoga for 2 hours together as a community. 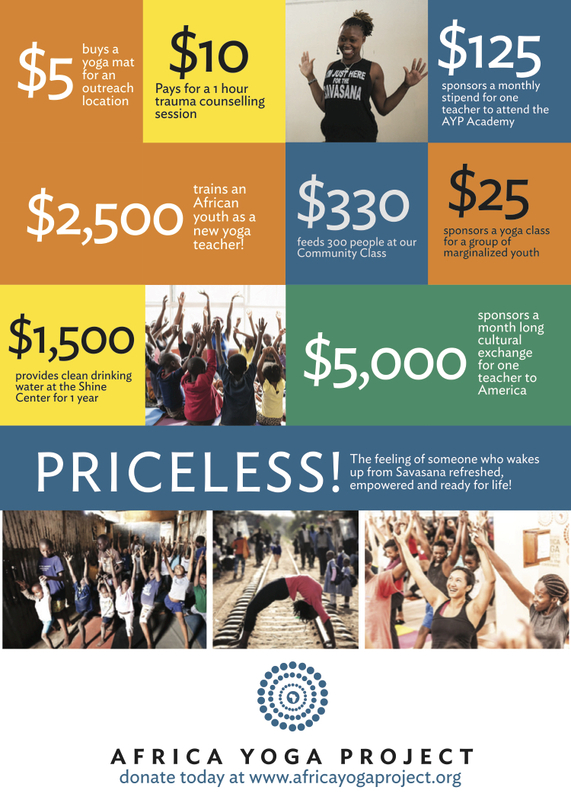 In order to support African youth and AYP, I’ve signed up to be an AYP June ’18 Ambassador and committed to raise $10,000 that will go directly to local programs that train young people as yoga teachers and for free community outreach classes across Africa. Upon reaching my fundraising goal, I will then self-fund my own service learning trip to join the AYP team in Kenya, where I will spend 14 days working directly with AYP teachers and the communities that Africa Yoga Project reaches. I hope you can join me in supporting AYP’s mission of empowering African youth. Donate today at any amount that you feel comfortable with. Andrea Gemma 06/05/2018 $50.00 Love that you're doing this and can't wait to hear all about it! Lucy Chow 05/27/2018 $200.00 Michelle, enjoy this journey! Gagan Porwal 03/27/2018 $150.00 Michelle ... You rock!! Yoshito Murakami 02/05/2018 $300.00 All the best! King Lee 01/14/2018 $100.00 Go Michelle Go! ABHIJEET BHANDARE 01/11/2018 $100.00 Go Michelle! Ehren Powell 12/19/2017 $50.00 Good luck with your project! Mohaned Eltayeb 12/19/2017 $100.00 Great initiative. Best of luck with it! Ron & Candi Bergida 09/27/2017 $150.00 We need more peace and tranquility in this world so anything that helps is a great idea. Colby Hanks 09/26/2017 $40.00 God bless you sister, LOVE this and cannot wait to hear all about it! Julie Scuderi 09/25/2017 $100.00 Keep being the change! Paola San Martini 09/24/2017 $30.00 I am donating from Uganda! I think I can appreciate what you are doing! All the best! Samie Tariq 09/24/2017 $500.00 May the force be with you. Mohammed Makki 09/24/2017 $500.00 Wish you all the best with this amazing goal. Bonnie Vozar 09/23/2017 $44.00 keep up the good work!! Cat Scott 09/23/2017 $242.00 So proud to have raised this money through Paige's class today at 502 Power Yoga!